Mercedes-Benz Malaysia has launched the Mercedes-Benz Star Mobile service, providing owners with maintenance and repair services right at their doorstep, without having to drop by a service centre. Currently, the pilot programme is being operated by Cycle & Carriage Bintang for customers within the Klang Valley. Services being offered through Star Mobile include scheduled vehicle maintenance, wiper blade replacements, battery replacements and key battery and infrared replacements. It operates out of a Mercedes-Benz Vito van, staffed by two qualified technicians and equipped with the brand’s Xentry diagnostic system, special tools and technicians’ hand tools to perform offsite repair and maintenance jobs. Customers can schedule an appointment for Star Mobile through any Cycle & Carriage dealership in the region, and the company is waiving the RM250 surcharge for the first three months. It is also providing cost estimates – including itemised costs for parts and labour costs – ahead of time to enable customers to make more informed decisions regarding maintenance. “Our customers are important to us, and we dedicate ourselves to continually learning and understanding their different needs and preferences. 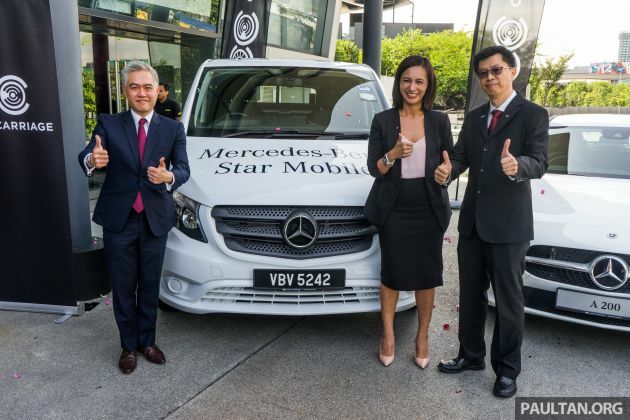 The Mercedes-Benz Star Mobile is a shining example of a premium service that delivers greater convenience and peace of mind when it comes to caring for our customers’ cherished Mercedes-Benz vehicles,” said Cycle & Carriage Bintang CEO Wilfrid Foo. The Mercedes-Benz Star Mobile operates daily except on public holidays, from 8:00 am to 8:00 pm Monday to Friday and from 8:00 am to 1:00 pm Saturday to Sunday. Good for Limousines and Taxi owners without much downtime except when it comes to major repairs needed. MBM better offers 5 Years Unlimited Free Scheduled Service programme. Prootn must learn how to work fast and give good service like this. I was a loyal Proton fan until I bought a Toyota. I see the difference now. My Proton send 9am in the morning, siap only 5pm. That also Glenmarie HQ. My Toyota I send 9am, siap 11am. Enough spoken. We’ve heard enough bullcrap from you. Honda was first to start opening 7 days a week service. To meet the crazy expectations of Malaysian customers. Yes, the buyers want a 5 days a week job but insist the workshop open 7 days a week thinking the mechanics are robots. It worker for Honda so much that some companies trying to emulate a similar formula. And now MBM is joining the fray too. All in the name of getting more car buyers. Very low level of humanity from the companies. There is labour office where employee can use to report if they are treated unfairly. These big company know very well not to do something which make them ‘famous’ for the wrong reason. Even Proton open on alternate Sunday but the company will replace the rest day. Off day and rest day does not necessarily fall on Sat and Sun. Ever heard of shift working hours? Don’t say dumb things. What low humanity? They have their shift systems in place. So by that kind of logic hospitals should be closed on weekends? Joker. stupid jaildisc didnt know that employees who work on weekends can take monday and tuesday off. So instead of getting their service floor dirty with oil, they will dirty customers garage floor instead? why a200 dont have under bonnet insulation ? cut cost ? Next Post: Petronas FP1 dihidupkan kembali di United Kingdom, jadi rebutan pengumpul motosikal di luar negara?